Hotel Exe Iris, Prague. 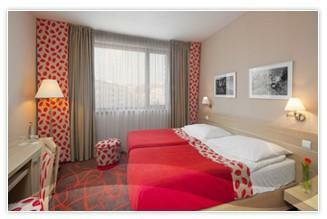 Exe Iris Hotel Prague. Hotel Exe Iris is a new four-star hotel based in Prague 10 district, just 15 minutes from city centre by public transport. Hotel is built as a part of the multi-purpose sports complex Eden Arena. From walking distance you can find Tesco shopping centre which is open non-stop. A tram stop with tram number 7, 22, 24 is located just opposite the hotel where you can buy transport tickets. Our hotel provides 150 air-conditioned and comfortably-furnished rooms with satellite TV and free Wi-Fi Internet connections.